Because of this debt, Cunard issued this £1.6 million mortgage bond which was secured by the fleet. The money raised was used to consolidate all that was still owed to finish building Lusitania and Mauretania, and it helped build Aquitania. It was due to be paid in annual installments of £81,600 every year for 10 years and would be paid in full by 1920. Because of war time profits, the debt was actually paid off a year early in 1919. I have never seen one of these before and have only read about them, but it feels like holding history in my hands. This beautifully crafted document is how Cunard financed and ultimately built some of their most famous ships. 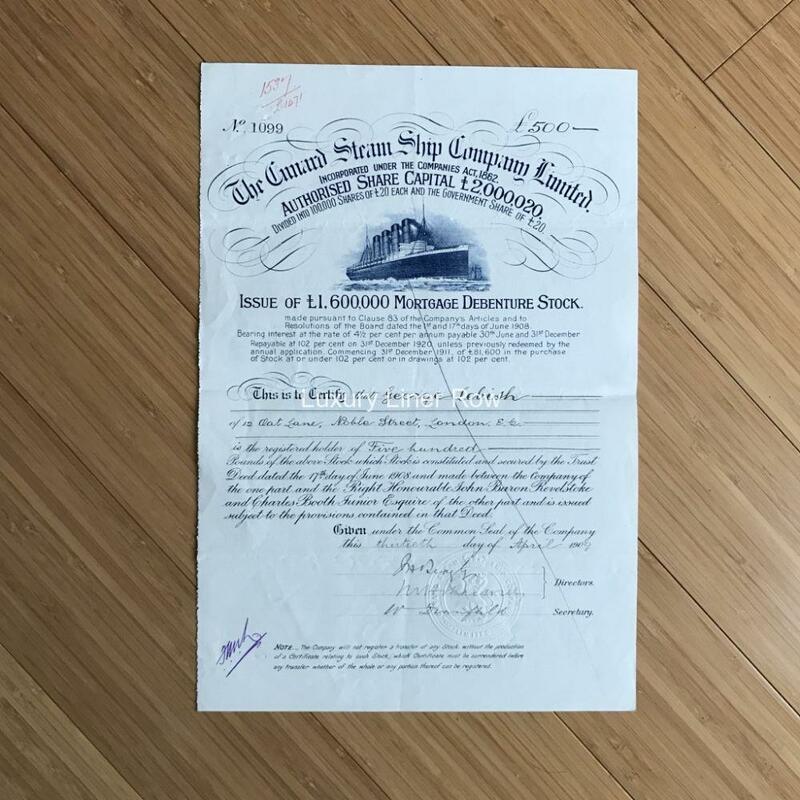 Beautifully embossed with the company’s official seal and hand signed by two of the directors — James Beazley and Maxwell H. Maxwell — it also sports a lovely engraving of Lusitania. I seriously doubt there are many of these out there because, upon redemption, most would have been shredded. In excellent condition!